An assortment of plain steel metric woodruff key variants from The Hillman Group. Woodruff keys are semi-circular keys that are commonly used for mechanical applications. It fits in a half-moon shaped slot, in a shaft, leaving the flat side of the tab exposed. They are designed not to function when excessive force is placed on the shaft. Variants in this assortment run 2mm thru 10mm in thickness. 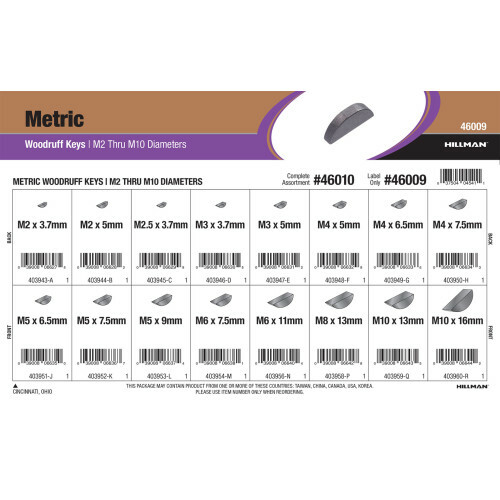 Full assortment contains sixteen (16) refills comprised of Hillman item numbers #403943 - #403954, #403956, and #403958 - #403960.